Many organizations are using SharePoint world-wide. In 2010, the “How is SharePoint used in Libraries?” survey found 16 out of 54 participants used SharePoint’s site features, such as the blog and wiki (Weldon, 2010). 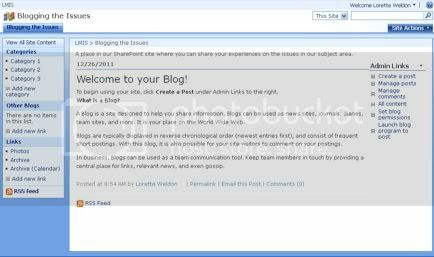 The blog is a site feature of SharePoint 2007 MOSS (WSS 3.0) that must be moderated through permissions and postings. From the “How is SharePoint used in Libraries?” survey, sixteen out of 54 librarians world-wide in the government, educational, private, and association sectors stated that they had used the features of SharePoint 2007 out of the box when it came to creating sites and web parts (Weldon, 2011). 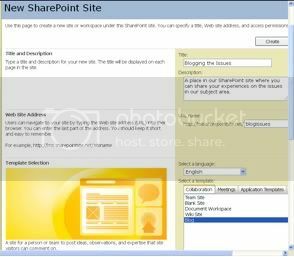 SharePoint 2007 allows the administrator to create as many sites and web parts with certain permissions designated to the users on their SharePoint platform environment. To expand their reaches to the public, some librarians in the survey wanted to have their blog sites open to the general public. In different business sectors, how could certain types of permissions on the site be set to maintain security protocols from within the organizations? 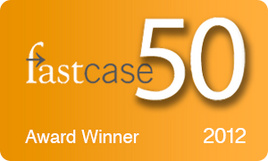 In 2010, all of the 54 survey participants responded that their organizations used the SharePoint 2007 MOSS platform. Sixteen librarians out of the 54 participants had created blogs and other sites to share library information with departmental staff. Some of the 16 participants wanted to have a portion of their sites open to readers outside of the their library department but still within the organization. All administration was controlled server side by the IT department. Since the IT department managed the server side, the participants came from an on-site environment rather than hosted environment (the server exists in the “clouds”). Through SharePoint’s much talked about social media template sites, organizations have found it difficult to moderate what information gets posted on their sites. Bialik (2011) found that “a basic math error” in a blog post caused S&P to fact-check its blog. The Internet is unpredictable, as can be seen in the case of the WikiLeaks controversy but Secretary Clinton wanted to have a “global commitment to Internet freedom” through the creation of the Office of the Coordinator for Cyber Issues (Hammond, 2011). How can librarians blog through the SharePoint platform to reach the eyes of other staff in other departments of their organization? Could librarians blog information about their library collections to the public? From my survey in 2010, blogs were being used mostly by the government and association sectors on-site (Weldon, 2010). These blogs existed on corporate sites so administrative rights were usually limited to their IT departments or the CIOs of the organizations. Figure 1. Blog site creation form for Team Website Owner. To create a basic blog, use the blog template under Site Action. Click on Sites and Workspaces under Websites. The IT department may push this form to you or they may fill it out based on your description of your department’s blog from their request form (see Figure 1). Once the form is filled out, the SharePoint platform creates the blog site (see Figure 2). Through SharePoint’s blog, in WSS 3.0, one person is placed in the administrator’s role and has the ability to manage and create posts. This person would also be allowed to manage comments and set blog permissions. WSS 3.0 works best in the Internet Explorer 7.0 browser. Figure 2. Blog site created for Team Website Owner. The default blog site, through the WSS 3.0 platform, divides the comments and posts into two lists. The moderator of the blog would be able to review the posts in one list while comments would be able to be reviewed in another list. Would a department give moderator rights to the librarian of a department? The moderator is an important role that would have the power to “approve” or reject comments before being displayed. When the blog site is created, it can inherit the parent site’s permissions or have separate permissions created. The blog site’s permissions have a default setting that works in most instances for blog participation from within the organization (See Figure 3). In my blog, “Blogging the Issues”, I kept my site’s default settings. Full control or moderator role would be designated to the Team Web Site Owners. Librarians have shared with me that the IT department would name them as the site owner or Contributor. If the organization had created a SharePoint platform governance, the IT department would be designated as the Team Web Site Owner with a librarian defined as a contributor. 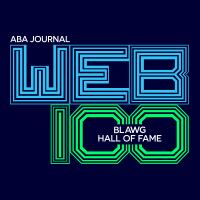 Readers of the blog would be defined as Team Web Site Visitors. Figure 3. Breakdown by web site group, type, user name, and permission level. Generally, users are given “read-only” permission but the moderator could also make them contributors so that they could add new comments to the postings. The contributors would need to be entered into the permissions list for comments. Some of the 16 participants who were using blogs, decided to disable comments for a public facing blog because it was too much to manage. Librarians have found that default site blogs from the SharePoint platform, could either be public or hidden. Usually, their blogs stayed hidden from the public because of classified information posted to the blog from their departments. It is usually too much trouble to try to hide some postings and comments in order to allow the public to use the same blog that the organization’s departments would use. The blog’s content has to be planned. What content would a public blog contain that a departmental blog would not and what would a departmental blog contain that the public should not see? Since the IT department usually is in charge of the creation of the blog, the site has contributor role dedicated to the librarian with the IT department with the final say of what becomes visible to the eyes of the organization’s staff. Some IT departments are overwhelmed with their other responsibilities so they “push” a contributor form to their “point in contact” of different departments. The “point in contacts” postings are allowed to post without review by the IT department. Comments are another level of permissions that IT department would have to plan how to review. It would be great to have immediate visibility of postings and comments. This would require less moderation and time from IT and the contributor. Through immediate postings, there would require a lot of interaction between the moderator and the contributors. Control is key to making sure that the content of the blog does not get out of hand. The blog, depending on the administrative rights given to the IT department’s “point of contact” (librarian/information professional), a blog can have other departments’ sites embedded within their blog site. Other departmental files, folders, or Web pages can function as linked content in an isolated module from other content on the blog site. This isolated environment can be created by clicking on Site Action and then Create. 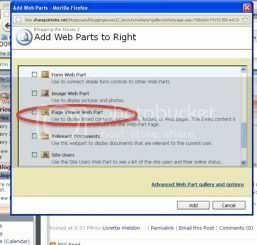 Through the selection of “Page Viewer Web part”, departments can share their information safely (see Figure 4). Figure 4. Selection of web parts to display information from other departments. The MS SharePoint platform can be very helpful in spreading news from your department and/or your organization. If you do not have the correct permission rules, the readers’ interactions with your electronic words may not work. One main question for your department and organization to answer is “Why does your organization or department need a blog?” If no one can answer that question, you and your organization or department may need to reconsider their need to have a blog. Blogs do take a lot of time in managing. Librarians that I have heard from have found a SharePoint blog could take as much time as their regular job in their organizations. Some IT departments design the blog to be run by a “point of contact” who would request actions to be done on the blog through a specially designed request form. Other IT departments have been found to give moderator roles to individual sites that a “point of contact” would manage individually. If the site is a blog, remember that a SharePoint site cannot be managed like your personal WordPress blog. The SharePoint blog is on a corporate site within a business environment. Your department and organization will need to create a governance plan for their blogs. This will help regulate how the blog will interact with its readers through postings, comments, and what information is to be viewed by certain users. Blogs offer more views. (2011, May 12). The Daily Post, pp. A.9. Haddix, D. (2011). Snapshots from our blogs. Investigative Reporters and Editors, Inc.the IRE Journal, 34(1), 34-35. Hammond, B. (2011). STATEs INTERNET FREEDOM INITIATIVE INCLUDES NEW CYBERSECURITY OFFICE. Cybersecurity Policy Report, , N_A-N_A. The U.S. Department of Commerce celebrates the United States’ entry into the open government partnership. (2011). United States, Lanham: Federal Information & News Dispatch, Inc.
University of Alabama’s government documents librarian blogs in public interest. (2009, Jul 21). US Fed News Service, Including US State News, pp. n/a. Publication, at http://web.fumsi.com/go/article/use/4714 in August 2010. Weldon, L.S.J. SharePoint without Coding: My Notes for Embedding the Librarian (Create Space). 2010. Weldon, L.S.J. SharePoint Without Coding, Volume 2: My Notes on the Further Embedment of the Librarian. (Create Space). 2011.